Here's another must-try when in South Cotabato. At a very affordable price of P60.00 per serving, Mang Johnny Halo-Halo sa Buko serves their own version of this popular refreshing Filipino dessert which is a mixture of preserved fruits like sweetened saba banana, sweetened camote, langka, nata de coco, crushed ice, evaporated milk, and a scoop of ube ice cream in a buko shell teaming with young coconut meat plus their own secret ingredient. 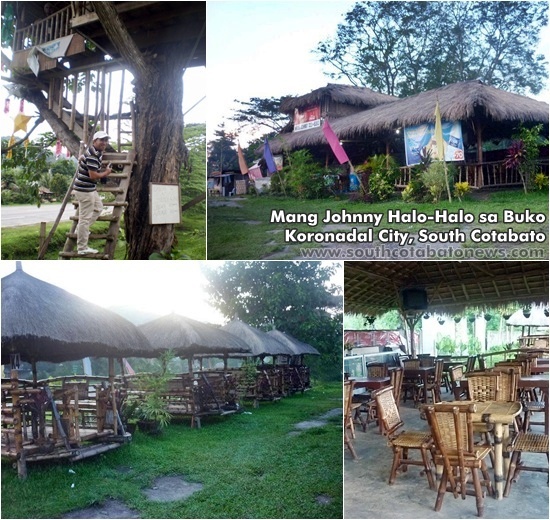 Mang Johnny Halo-halo sa Buko is located along the national highway in Purok Maunlad, Brgy. Saravia, City of Koronadal. Visit them and try Mang Johnny Halo-halo sa Buko to find out yourself why they're claiming, "mas masarap ang halo-halo dito.."